Here’s your weekly dose of Yuri!!! On Ice production details, enjoy! This time we’ll be talking about the free program costumes from the Rostelecom Cup in episode 9. Well, let’s get right to it! Why don’t we go in the order they skated this time? First up: Emil Nekola. Sure. The request I was given for his costume was, “near-future, scifi-ish”. I decided to make the fabric choice a focal point: a stamped velour, similar to what I picked for Michele Crispino’s SP costume, in a slightly silvery blue, or a foil print on a navy base. They were pretty heavy fabric options. It looks like they opted for the stamped velour’s blue for the anime. There are geometric patterned section on the sides––it’s made up of a shiny material and a fishnet material. The style lines are created with a silver foil fabric sewn over the top. 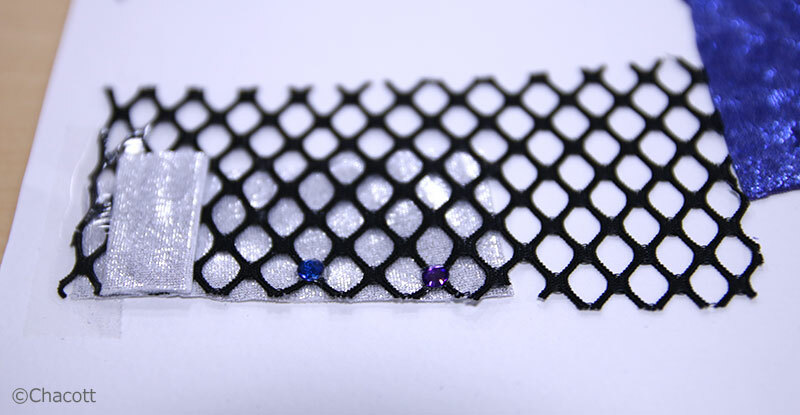 A rhinestone is carefully applied at each of the cross points in the fishnet. I made an effort to show off his figure. since Emil is into extreme sports in the off-season, so I imagine he must be quite built. 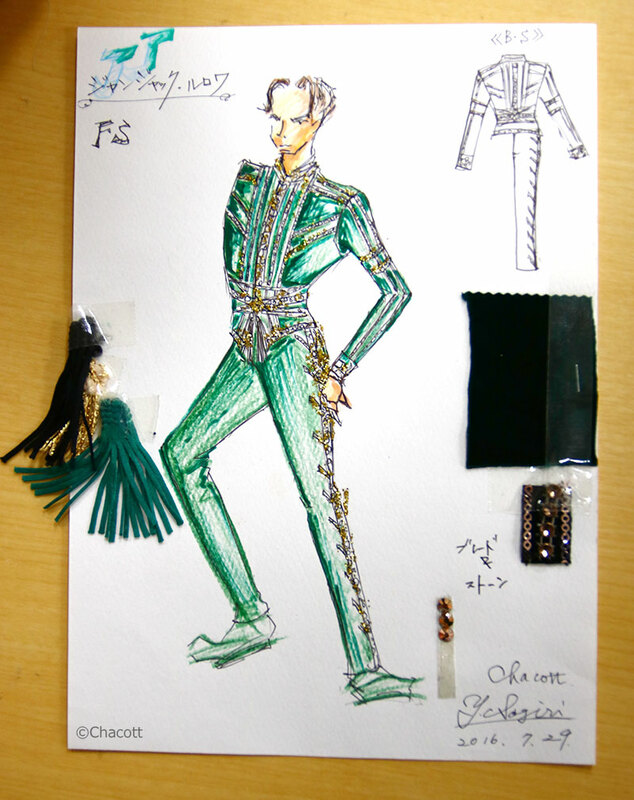 Next up is Michele Crispino––whose costume looks quite different in the design sketch. Could you tell us a little about this one? 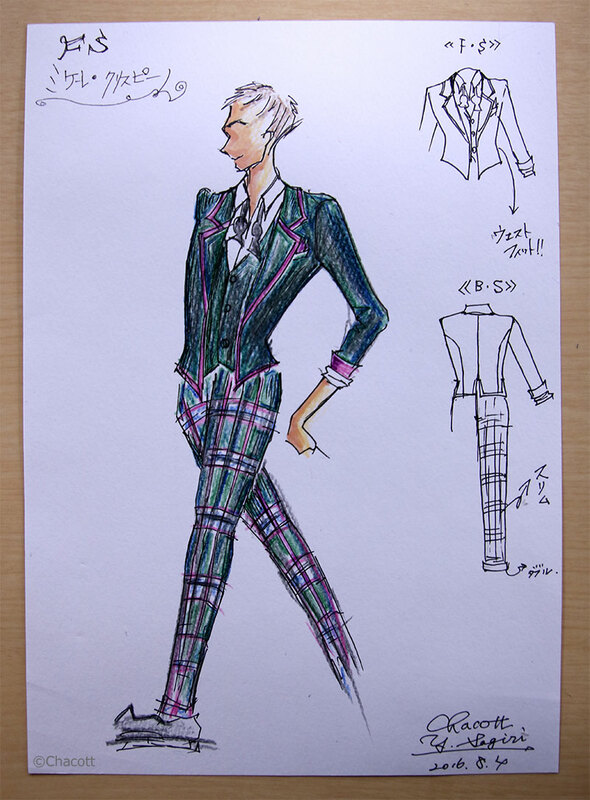 In the original design, he’s wearing a plain jacket and pants made from an oversized plaid. First I tried imagining what Italian men must wear on dates and settled on going the jacket route. Michele doesn’t have much confidence in his fashion sense, so I figured he’s the type to ask his sister Sara what to wear––I made sure to include a touch of her taste in the design. The pink touches give it a ‘cute’ feel, is that from Sara? The design documents I was given mentioned that [she] wears pink headphones, hence the pink touches. I opted for an over-sized plaid for the pants so it would be visible from the rink. 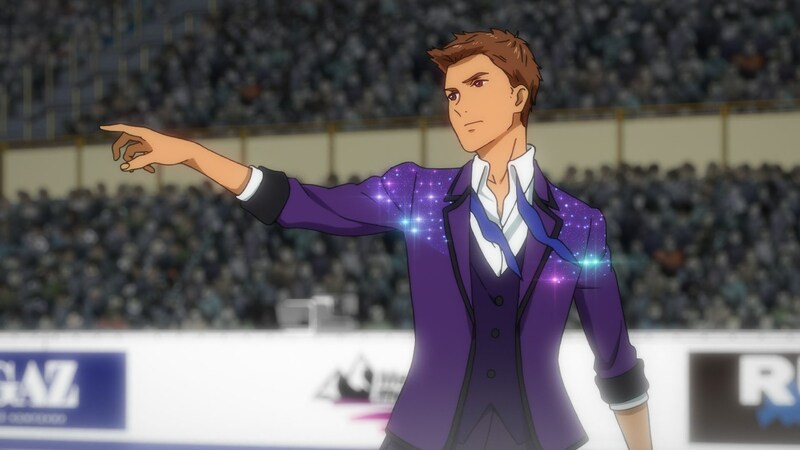 In the anime, he ended up in plain purple fabric, but the shirt, vest, jacket, and tie arrangement remain the same. Yes, and they made the jacket sparkly too. By the way, the shirt, vest, and jacket set wouldn’t actually be separate layers but all sewn together as one garment. 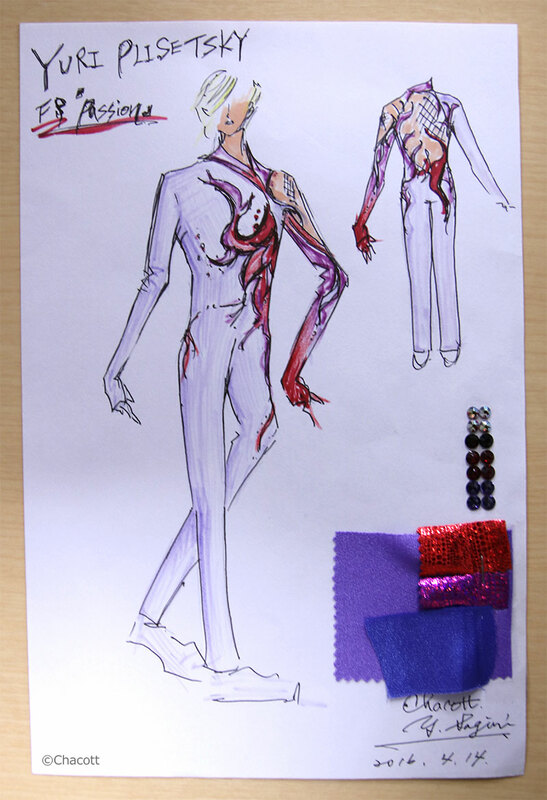 Next up is Yuri Plisetsky’s costume. It has a very bold red pattern, doesn’t it? The theme was “PASSION”. I wanted to express the firey, tempestuous emotions of his teenage rebellion phase. I think there’s also a side of him that wants to appear cool and composed, so I used a lavender base. I’m told that when it comes to flames, it’s actually the blue portions that are hotter than the red ones, so I went with the cool-toned bodysuit to suggest even hotter passion concealed within. Yes, the idea was to make it look like the decorative elements were directly on his skin. They used black mesh in the anime, but [in the original concept] it would have been beige stocking net with flame appliqué on top. You maintain some translucency when you only use one layer of mesh. If fit properly, you’d be able to clearly see the movement of his shoulder blades beneath the fabric. I also gave him gloves covering all five fingers. How does he even get in and out of this one? There’s an invisible zipper hidden in the asymmetrical neckline (you wouldn’t really be able to see the stitches). Lastly, let’s talk about Jean-Jaques Leroy. How did you approach this costume? As he frequently says himself he has something of a “kingly” image, so I went with a rich colored, luxurious feeling stretch velour. Unfortunately it didn’t get used in the animated version, but there was a lot more gold in the design. I had intended for the gold to stand out even more in contrast to the deep color of the costume’s base. I created metallic lines with gold braid and sequins. The sides of his pants have a herringbone design too. No, this would be a two-piece costume. The belt would actually be part of the top, and it has black, green and gold tassels around the center. Give us a little bit of trivia! Velour has something called nap [the direction of the pile], and the amount of luster and the depth of the color can change depending on the direction of the fabric. 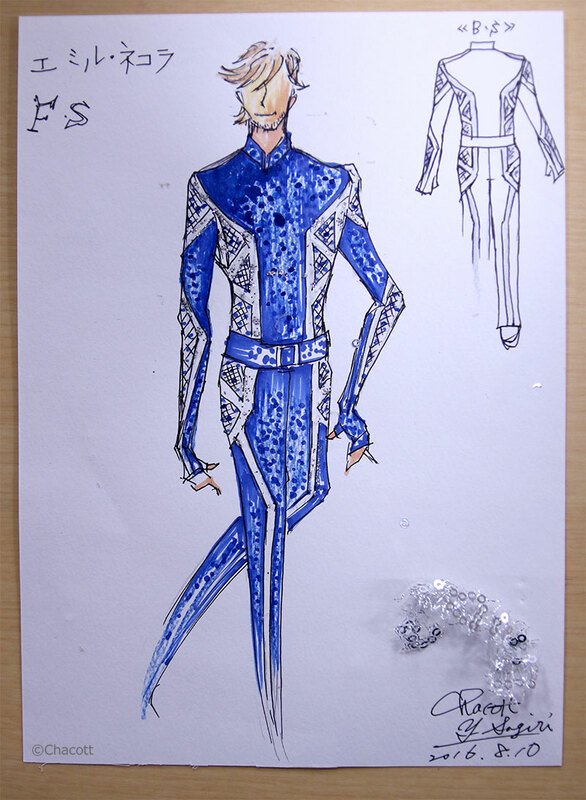 For JJ’s costume, the nap would be oriented the opposite direction of how we would normally apply it to give the color more richness and depth! That’s it for this installment. There are only a few episodes left in the anime, what kind of new costumes could there be left for us to see… You’ll just have to wait to find out!